The Asbury Park press did a feature article about me and my work. Click here to read the article. 2013 Asbury Park Sun, Nov 20, "Finished Tables for Community Project to be Displayed". Feature article about my contribution to Table Talk, with two photo credits. ..........Asbury Park Press, May 10, p 16, "Swimming Upstream". Review of group exhibition at Arts Guild New Jersey by Ralph J. Bellantoni. 2009 Cougar's Byte, Oct 6, p 8, "Celebrating The Talent of Adjuncts". Feature article about group exhibition at Kean University by Benito Nieves, with one illustration. ..........Religion and Education (academic journal) University of Northern Iowa, Spring, Vol 36, N 1. Cover illustration. 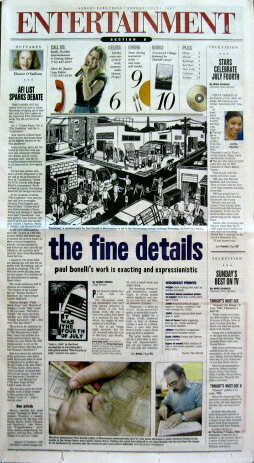 2007 Asbury Park Press, July 1, p E1, E4, "The Fine Details". Feature article about my process, artwork, and studio by Bobbi Seidel, with 2 illustrations and 3 photos. 2006 The Coast Star (Manasquan, NJ), July 27, p 20, "Local artist discovers common ground in the most uncommon". Feature about upcoming show at Landmark Books by Cheryl Harvey, with two illustrations.
. ..........Cougar's Byte, Oct 17, pp.1-2, "A Piece of Art A Day Keeps Boredom Away". Review of solo show at Kean University by Jen Bissu, with 3 illustrations. 2004 Newark Star-Ledger, Aug 8, Sec 4, p 2,"Hunterdon museum brings together 'cool' exhibitions". Review of solo show by Dan Bischoff, with 2 illustrations. ..........Princeton Packet, July 16, pp 18-9, "You Are What You Eat". Feature about upcoming show at Hunterdon museum by Susan Van Dongen, with 5 illustrations. 2003 Newark Star-Ledger, June 8, p 5, "Printmaker molds technology to her own artistry". Review of group show at Hunterdon Museum by Dan Bischoff. 2002 Courier News (Bridgewater, NJ), Aug 22, pp F1, 18, "Art Lovers can devour 'Food Chain'". Review of group exhibition at PCNJ by Ralph Bellantoni, with 2 illustrations. 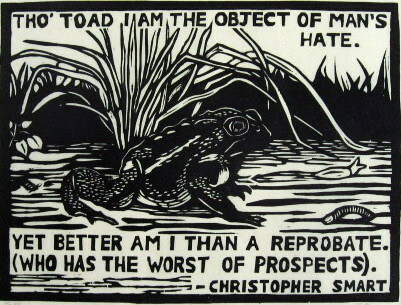 ..........New York Times, May 12, p 11, "A Printmaker's Work as Mirrored by Others". Review of group exhibition at Hunterdon Museum by William Zimmer. ..........Geraldine R. Dodge Foundation Annual Report (for 2001), July, p. 40. Illustration for section heading. ..........Religion and Education (academic journal) University of Northern Iowa, Fall, Vol 29, N 2. Cover illustration. 1999 Newark Star-Ledger, Aug 6, p 41, "Medium well". Review of group exhibition at Newark Museum by Dan Bischoff. 1998 Home News Tribune (East Brunswick, NJ), Dec, p E1, 7, "Prints: The Real Thing". Review of group exhibition at PCNJ by Laurie Graniere, with illustration. ..........Newark Star-Ledger, Nov 22, sec 4, p 6, "Diverse Dialogues". Review of group exhibition at Aljira by Dan Bischoff. ..........Hudson (NJ) Reporter, June 28, pp 12-3, "Visually Speaking". Review of group exhibition at Union Hill Arts and Crafts by Artie Jacob. ..........Wall Herald, Mar 6, pp B1-2, "Finding St Everyman and ninjas in the aisles". Review of solo exhibition at Monmouth County Library- Wall, NJ by B.A. Sweeny, with 2 illustrations. 1997 Philadelphia Forum, July 31, p 8, "The God of Many Faces". Review of group exhibition at Balch Institute by Andrew Mangravite. Check out Jen Bissu's article about my 2005 exhibition of the Fourth of July. Includes a slide show of images.